Apartment Schulz i Berlin, Tyskland : Boka nu! Now open...our new 40 sqm Apartment...Very nice and cosy. Own shower/toilet room and Kitchen room. 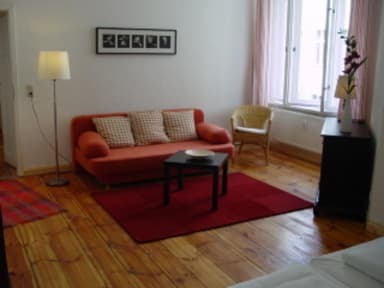 Schulz Apartment is a spacious apartment located in a lively area of Berlin Prenzlauer Berg. We have got five nice apartments with 1x single-, 4 x double-, 2 x 2-bed and 2 x triple bedrooms available. There is a shared kitchen and bathroom for guests in each of the apartments. Prenzlauer Berg in Berlin is renowned for its trendy cafes, bars and shops and is a renowned historical quarter of Berlin. There is a metro stop just a few minutes walk away giving easy access to Berlins main sights. 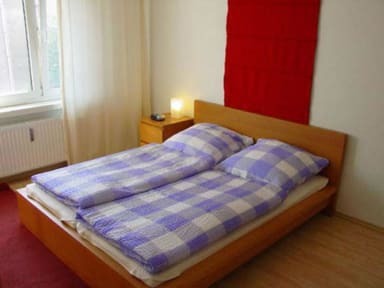 It is just 5 minutes to the Max-Schmeeling Halle and 10 minutes to the Kulturbrauerei and Kollwitzplatz. Property will pre-authorise the card with the amount of one night stay after the booking is made.